The Stormtrooper Dressing Gowns have detailing inspired by the Stormtrooper outfits! A long time ago, in a galaxy far far away… the tatty old dressing gown he got during the Gulf War used to look great. Slip that imperial bod into one of these classy Stormtrooper Luxury Dressing Gowns instead! 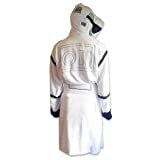 Brilliant as Father’s Day gifts and Birthday gifts for boys who love George Lucas’ most celebrated work, these licenced bathrobes are based on the Stormtrooper’s armour.He can snuggle up to his Princess Leia in one of our cotton velour mens robes and storm-troop his way through the house like a Galactic hunk. With a long sash belt to keep his little Lightsaber from popping out, and 2 pockets for the tv remote and a phone, he can be ultra comfortable whilst completing that Imperial Mission to boil the kettle.